Tsinandali Foundation, in partnership with the Georgian Government and the founders of the Verbier Festival, Avi Shoshani, and Martin Engstroem stated that Gianandrea Noseda was appointed as a music director of Georgia’s Tsinandali Festival of classical music. The appointment of Italian conductor took place in Verbier, Switzerland on August 2. The Georgian National Tourism Administration (GNTA) of the Ministry of Economy and Silk Road Group signed a memorandum of understanding in 2017 to launch Tsinandali Festival of classical music. The Chairman of the board of the Silk Road Group, George Ramishvili stated that Tsinandali Foundation is committed to investing in the bright and peaceful future of the talented young musicians of the region. "Our vision for the Tsinandali Estate from day one, when the Silk Road Group engaged with the project was always to establish a meaningful and sustainable cultural and educational center in Georgia. The importance of the language of music initiative cannot be underestimated, as the music is the most powerful ambassador for peace, prosperity and for strengthening the cultural and economic ties among the Caucasian nations,” he said. “We are beyond excited about Maestro Noseda’s appointment as the Head conductor of the Tsinandali International Classic Music Festival,” Festival Director, David Sakvarelidze said. Tsinandali is an estate and historic winery in Kakheti that belonged to the 19th-century aristocratic poet Alexander Chavchavadze. Now it represents a museum that hosts many local and international visitors. 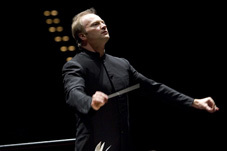 Gianandrea Noseda is an Italian conductor who is widely recognized as one of the leading conductors of his generation. Noseda studied piano and composition in Milan. He began conducting studies at age 27. He has conducted several recordings with the BBC Philharmonic for the Chandos label, of Prokofiev, Dallapiccola, etc. Since 2017, Noseda has served as Music Director of the National Symphony Orchestra in Washington, DC. He is Principal Guest Conductor of the London Symphony Orchestra and the Israel Philharmonic Orchestra, Principal Conductor of the Orquesta de Cadaques, and Artistic Director of the Stresa Festival in Stresa, Italy.